I spent some quality time yesterday with a recently released CD from Albany Records. Donald Martino – later works (TROY1167 - ASIN: B00005RGK9) is a professionally produced and exquisitely performed collection of four very significant works composed by Martino in the few years before his untimely death in 2005. The disc includes two Trios: one for Clarinet, Cello, and Piano (2003); and another for Violin, Violoncello, and Piano (2004). The recording is rounded out with the Sonata No. 2 for Violin and Piano (2004) and Martino’s Fifth String Quartet (2004). As a disclaimer, I should mention that I have closely followed this composers’ music, and over a period of time lasting nearly three decades had been amongst Martino’s circle of friends and former students. I’ve always considered him a grand master and I have tried to advocate for his work in whatever ways I could. In fact, two of the pieces on this CD (Sonata No. 2 and the Trio for Vln, Vlc, and Pno) received their first public performances shortly after the composers’ death at a concert sponsored, curated, and organized by my group the LUMEN Contemporary Music Ensemble. The concert at Harvard University’s Paine Hall was originally intended as a 75th birthday tribute. Sadly, it turned out to be a memorial concert, and Don never got to hear these two works performed live. For me, as I listen to the new CD on Albany Records, it evokes multiple layers of experience, personal history, context, and emotion – all of which are inexorably entwined and complex in nature. After all, I was in frequent contact and relatively close to the composer personally when he created these amazing late works and was privileged to witness first hand his penultimate burst of musical creativity even as his physical health was in steady decline. I recall visiting him at a Boston rehabilitation hospital where he was recovering for one of his many surgeries and wondered to myself how long he would survive his ordeals. Yet Martino somehow found clarity of strength, focus, concentration, and mustered enough physical energy to compose some of the finest work of his long and distinguished career. My memories of those final years are bitter-sweet. The four works on this CD were composed from 2003-2005, yet only the earliest - the Trio for Cl, Vlc, and Pno - was actually requested by an ensemble and commissioned. All of the other works from this period were labors of love, composed with little more than a hope that they might be performed by competent musicians: somehow, somewhere, someday. At least to me, this seemed to be surprising and unjust predicament for an Internationally-known Pulitzer Prize-winning composer to find himself in. By most standards of measure, he should have been entering the pinnacle of his career. And yet, while coping with ill health, Martino crafted his final masterpieces undeterred by an apparent lack of interest in his work. He avoided being distracted by the noise around him. It’s really a sad state of affairs that Martino’s late music wasn’t performed in his lifetime. Although this wonderful CD on Albany Records goes a long way to makeup for the transgression, there is still an important piece of recent music history that in my view is waiting for the light of day. Martino’s last completed work was a Concerto for Orchestra. In my view it is a piece of music equal in quality and significance to Béla Bartók’s work of the same name. Martino’s Concerto was not commissioned by any orchestra, is ready to go, but for reasons that I don’t fully understand - has yet to be programmed and performed. To this day, I find this odd. Compared with some of the new works that have been commissioned and performed by major orchestras in recent years, it seems strange indeed that Martino’s remarkable Concerto is still sitting idle in the drawer of his publisher. The work is a hidden treasure, and my hope is that an enlightened music director with a first-tier symphony orchestra will in time make the discovery and give Martino’s Concerto for Orchestra its just due. However, there are also reasons for fans of Martino’s music to be optimistic. The Albany CD by the Group for Contemporary Music is one such example. We should be grateful for the sensitivity, dedication, and skill of the performers who perform on this recording. Chris Finckel (cello), Stephen Gosling (piano), Gregory Hesselink (cello), Margaret Kampmeier (piano), Aleck Karis (piano), Alan R. Kay (clarinet), Curtis Macomber (violin), Lois Martin (viola), and Fred Sherry (cello), and Carol Zeavin (violin) all perform Martino’s music with an informed sensibility and artistic grace. Martino surely would have been overjoyed and thrilled with the quality of their astute performances. Donald Martino – late works is the brainchild and polished product of Howard Stokar – who served as the project instigator and executive producer. He deserves much credit for bringing this important CD to the public. It’s a recording worthy of a Grammy Award in the new music category for 2011, and I sincerely hope that it wins one. 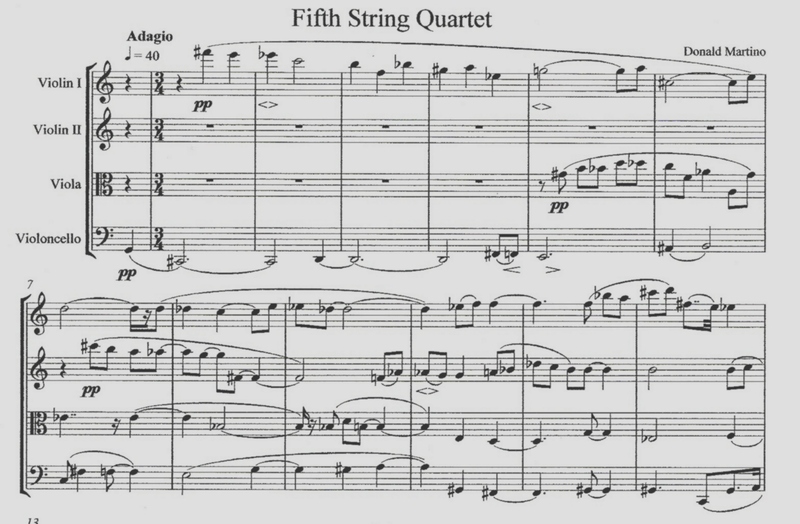 While I know all four works on this recording from score (published posthumously by Dantalian), and have a sense about their place in the trajectory of Martino’s impressive body of work, I’d like to focus the rest of this blog post on one particular piece - The Fifth String Quartet since I can offer some anecdotal information that may be of interest. Don Martino composed his Fifth String Quartet in 2004. Unlike his earlier work in this medium composed more than twenty years earlier for the Juilliard Quartet, his Fifth was not written with any specific group of musicians in mind. As with other works from his late period, the Fifth bares no explicit dedication. However, the work was programmed by the Lydian String Quartet and premiered on their concert series at Brandeis University early in 2005 on a concert that included another work with similar characteristics: Beethoven’s C-sharp minor Quartet, Op. 131. I recall the first performance of Martino’s Fifth String Quartet rather well. The Lyds are an excellent ensemble, and draw large and dedicated audiences – although not necessarily from the ranks of the small but committed new music crowd. In fact it was not easy to obtain tickets to the concert since it was part of the Lyds regular subscription series. Fortunately I had a connection with the Chair of the Brandeis Music Department at the time, and responding to my desperate inquiry, he magically pulled out of his desk drawer a secret stash of VIP tickets and handed them over to me (thanks Davy!). Aside from a few members of the Brandeis composition faculty, there were very few composers present in the audience. I’ve rarely missed a premiere of any of Don Martino’s works over the past three-plus decades, and this is one that I really enjoyed. Martino’s music is often hard to take in on the first hearing, but to me the Fifth Quartet sounded rather classical – and in some ways the musical language seemed to reflect the influence of Arnold Schoenberg. In the classes he taught at New England Conservatory and at Brandeis, Martino would often bring up and discuss the Schoenberg Fourth String Quartet - often playing themes from the work on the piano from memory. I’ve seen his personal copy of the score to Schoenberg’s Fourth Quartet, and it is heavily annotated in colors from front to back and filled with analytical markings and indications that aim to explain the derivation of every note in the work. At least in the 1970s and 80s (and perhaps in the 50s and 60s), Schoenberg seemed to be a composer that Martino not only respected, but looked up to as a source of inspiration. Sure, Martino’s music was quite different in many ways, but I’ve always felt that there was a musical connection of sorts. But it appears that Kirzinger and I got it wrong! In the brief moment I had to talk to Martino after the premiere of his Fifth String Quartet, I uttered something to affect, “Parts of your new work remind me of Schoenberg.” I truly meant it as a compliment. My impromptu, off-the-cuff, and possibly naive statement would ultimately turn out to be the source of a rather interesting point of contention. I cautiously replied by email to my former teacher and esteemed mentor. I wrote that I sensed a vague similarity in the harmonic flow, phrase structure, use of repeated notes, and rhythmic texture between his new piece and some of Schoenberg’s works - such as the Op. 29 (which I had just heard Gunther Schuller conduct in a performance with the Dinosaur Annex Music Ensemble). Perhaps all of this discord could have been avoided if I had kept my mouth shut and asserted my Constitutional right to remain silent, i.e. taken the Fifth (amendment) on the subject of his Fifth. This was a bit of a surprise. Martino’s basement music room was full of scores, and I would have thought he’d have a copy of Schoenberg’s Op. 29 – or at least a recording. I promptly sent him a copy of my score and a CD of the Boulez performance of the work on Sony. Dear Jim, AS arrived this afternoon and I have had my way with him. I will return materials on Monday if I get a chance to get out of the house. ...As to the Schoenberg Suite -- it has nothing to do with our concert. I am still pondering with wonder your comparison of my new work with him. I have most of the scores but I wanted to refresh my memory of the Suite. My work is different from his in so many ways, I can't find a single similarity. My music according to A. Porter is lyric even when it is edgy -- S's music is to my ear (after Pierrot) uniformly ugly and pedantic with the countenance of stale and heavy German pastry. Our concepts of form, melodic shape, gesture, harmony etc. are totally dissimilar. I haven’t got time to detail it but let me point to just one aspect: rhythm. In most cases in his music after Pierrot he uses repeated notes (usually two but sometimes they grow) and repeated two note interval figures (like c up to Bb)(usually in 16ths) to excess in his accompaniments as well as the repeated note anticipation in his melodies. Brahms -- and I learned from him--always ties the anticipation to the main note and slurs the entire figure. In that way he avoids the march-like quality that is to me so much a part of S's stuff. What’s more, he tends to do this in every movement, except the slow movement (and he often can't avoid the repeated tone temptation even in a slow movements as the movement unfolds, of a single piece so that all the movements have a sameness about them regardless of whether he uses the movement description Allegro, Comoro, Intermezzo, Rondo... You find this in the Wind Quintet, the third quartet...and just as I had recalled, the Suite is perhaps the worst offender. By contrast I hardly ever use repeated tones. IN THE NEW SONATA THERE IS NOT ONE INSTANCE OF REPEATED TONES OR REPEATED FIGURES. That does not make my music better than his but it sure makes it different. I hasten to add, for what it's worth, that if I found this tendency to do the same thing in every movement in a student's work, I would sharply criticize it and I'd send him/her back to the drawing board. I find this discourse via email about the relationship between Martino’s and Schoenberg’s music to be highly intriguing. His comments should be of interest to anyone interested in tracing the roots, connections, and influences that exist between significant composers working in the 20 and 21st centuries. Clearly, Martino and Schoenberg shared a common musical ancestry: namely the masterpieces of Beethoven, Brahms - and perhaps more generally to the works of 19th century Romanticism as a whole. As an example, I recently observed how Martino’s piano writing in Fantasies and Impromptus for solo piano (1981) utilize trills in the same way that Beethoven did in his late piano sonatas (Op. 109 was one of Martino’s favorite works). Perhaps that is the reason why some of us intuit a similarity of style between Schoenberg and Martino. The great classical tradition served as a common wellspring for both of these composers, and each in their own way drew inspiration directly from it, and independently from one another. In the end, the fact that Schoenberg and Martino both used the 12-tone system is an insignificant detail and an irrelevant fact. The fact that their music is closely attuned to and solidly grounded in the same venerable tradition of Western classical music is undeniable. Regrettably there are those who don’t harbor a respect for music history, and they won’t appreciate the weight of this similarity. The music of Martino’s late period does in fact mark a departure for a composer who was beginning to venture into new and fertile ground. Perhaps it was the onset of the new millennium that instigated it. Or perhaps it was his failing health and a growing sense of his own mortality that triggered his shift in perspective and attitude. In the few years before his untimely death in 2005, Martino had rekindled an interest in one of his early musical inspirations: the music of Béla Bartók. It is not surprising that given his quickly evolving and transformative musical language born late in life, that Schoenberg would be seen by him as overtly square and reactionary. When one considers all five of Martino’s String Quartets as an expansive collection, his compositional evolution becomes clearer. His quartets numbers Two and Three were composed in 1952 and 1953 respectively. As a self-publisher, Martino revisited his early work, and added these non-serial pieces to his published catalog. 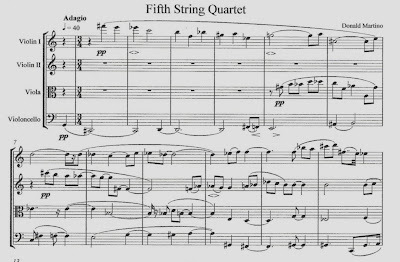 In some sense, as a composer, he was completing a great circle when he wrote his Fifth String Quartet. One bright light regarding the Martino’s Fifth String Quartet is that the world-renown Juilliard String Quartet has adopted it for their 2010-2011 concert series. It will be on one of the pre-set standard programs that the esteemed group will take on its’ world concert tour. It will likely be performed hundreds of times for thousands of people who are not associated with or incessantly entrenched in the usual new music ghetto. I’m glad to see this composer finally gain the worthy recognition that he deserves with new recordings and major-league performances – although it is a shame that he spent the last years of his life working in relative isolation and without much notice. I hope that the broader public will be drawn to this unique composers’ music and that the labors of his perfected craft will in time become a mainstay of the musical tradition he himself so adamantly admired.